Russia launched a Soyuz rocket Wednesday with a military communications satellite to link ground forces, ships and aircraft in the Arctic and Siberia. The Soyuz rocket launched at 1142 GMT (6:42 a.m. EST) from the Plesetsk Cosmodrome, a military-run base in northern Russia's Archangelsk oblast, according to the Russian space agency. Liftoff occurred at 3:42 p.m. Moscow time. The rocket flew in the Soyuz 2-1a configuration with a digital flight control system and an enlarged payload fairing. A Fregat upper stage fired three times to place its satellite passenger - a Meridian communications spacecraft - into the correct orbit. The launch was targeting an orbit with a low point of 620 miles, a high point of nearly 25,000 miles, and an inclination of 62.8 degrees. 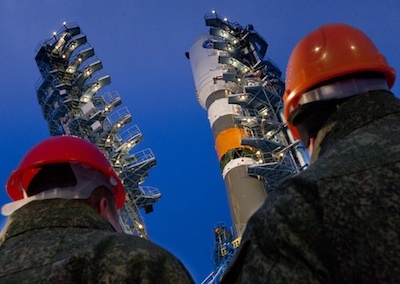 Russian officials declared the launch a success, and the Novosti news agency reported engineers established a "reliable communications and data link" with the satellite. Deployment of the Meridian payload occurred around 1400 GMT (9 a.m. EDT), Novosti reported. Wednesday's flight was the first Meridian satellite launch since a Soyuz rocket failure destroyed an identical spacecraft in December 2011. It was the sixth Meridian payload launched since 2006. Meridian communications satellites are positioned in high-altitude, or Molniya-type, orbits covering polar regions, which are out of range of traditional communications satellites stationed over the equator. The spacecraft are manufactured by ISS Reshetnev, a Russian space contractor, as replacements for a previous generation of Molniya communications satellites. The Meridian satellites link Russian ground forces, aircraft, ships and command centers in the Arctic, Siberia and the North Sea. Sergei Shoigu, Russia's new defense minister, toured Plesetsk on Wednesday and observed the launch, according to the Russian defense ministry.